I came, I swam, I conquered. And it all happens here (although the lap lines in this photo are running in the wrong direction, for some odd reason). 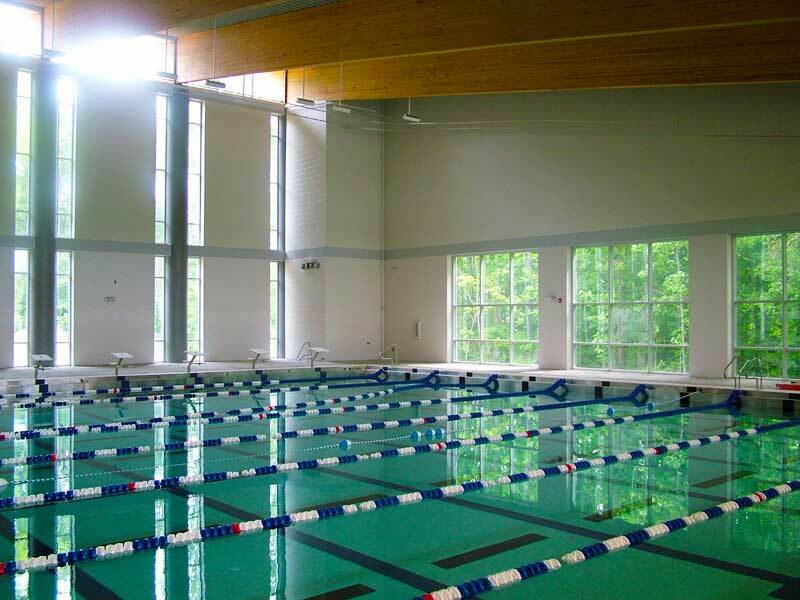 I swim in this lap pool and there’s another large pool to its left, with warmer water for different recreational needs. 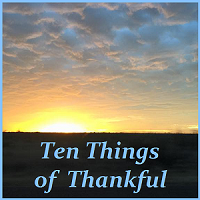 Here are my Ten Things of Thankful, the thoughts that come to mind as I swim (thanks, Lizzi, for your inspiration, in “Here Be Heroes!“). I am blessed to live in a resource-rich community that invests in many opportunities for recreation, including 4 public pools. This is where I swim, where I enjoy seeing blacks and whites sharing the same facilities, supervised by black and white lifeguards. Back in the day, I worked hard with others to successfully desegregate a pool in another city. I’ve certainly delighted in using that pool, now full of black and white swimmers! I enjoy listening to the shrieks of excitement (and just plain shrieks) as busloads of special needs kids swim and splash in the rec pool a few times a week. And three lanes of the lap pool are also used by the more athletic kiddos. It reminds me of teaching special needs kids to swim in San Jose, where the smell of Vidalia onions in nearby farmlands was even stronger than the smell of chlorine. We had a lot of fun, once we got our toes wet. When I pause to look at the rec pool, I think back to my days after knee surgery. I would wobble on my crutches to the side of the warmer pool, scaring the lifeguards who told me that crutches and wet tiles were a bad combination. Of course I knew that, but how else was I going to get to the pool? My wheelchair was at school since I couldn’t haul it in and out of my car. You know I am grateful to have retired both the crutches AND the wheelchair. As I swim through thousands of gallons of clean water, I think about the women who spend all day carrying heavy loads of dirty water for cooking and bathing. I’m grateful for organizations like Charity: Water for helping us make changes in the lives of folks who could never imagine having enough clean water for something as nonessential as recreation. When I’m in the locker room, my heart is overjoyed to hear parents lovingly help their kids wrangle swimsuits and adjust to wet floors, hot showers, and goggles. I listen to the camaraderie of women who participate in aquatic exercises. I watch the swim teams excitedly prepare for practice and meets, all the while texting and talking about school assignments. My knees and hips are thrilled when I swim. I fantasize about swimming like a dolphin, or swimming in heaven where I’m sure I will be a faster swimmer! I always try to “beat” those who swim within sight of my steamed-up goggles. How wonderful to have found a pair of goggles that actually fit! I pray that the dear lady sharing the lane won’t clobber me as she does a backstroke. I feel the smooth water over every inch of my body, grateful that I am not paralyzed after a dreadful horseback riding accident. Finally, if I am in a lane by myself, not having to watch out for flaying limbs, I use my swimming time to pray. I thank the One who made me for all those thoughts and experiences which make swimming so special! 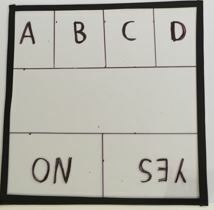 I’ve been asked about low tech eye gaze charts. I’m an experimenter with these, not an expert. I made the two charts below using clear acrylic sheets and permanent markers. I like clear eye gaze charts so I can watch the student’s eyes as we use the charts. I can also point to something and get an easy confirmatory response (such as looking at me through the chart). Black electrical tape around the edges protects my student from sharp edges! This 12′ by 24′ chart (resting on a white board so the letters are visible) is for word responses that need to be spelled. My student uses this during the writing process if I haven’t included specific words in the First Author word banks. I use the chart below for most eye gaze interactions. I provide two to four answer choices (A,B,C, or D) or ask for a simple YES/NO. I flip the board around, depending upon what kind of answer choice is needed. I am going to cut another 12′ by 12′ board because this chart is too long and bumps into trays or a desk when I hold it at the student’s eye level. Here’s a link to other types of eye gaze charts: Writing with Alternative Pencils. If you have experience using eye gaze charts, I love to hear about it! * The eyes have it! Literally. Eye gaze technology has the capacity to change the lives of kids (and adults) who cannot communicate effectively by speaking or using their hands. I have been using a couple of low tech, see-through eye gaze charts with one such challenged youngster. Low tech charts work but can be exhausting for kiddos who are spelling out individual words. Enter TOBII, an incredible piece of technology which has already been a game-changer for my student. Tobii is officially called Tobii Dynavox PCEye Go. It makes the entire (PC) computer accessible. When combined with software from HelpKidzLearn, you have a winning combination! The image above is a MacBook Air running WIndows 10. Just imagine how long it took to make THAT happen. But it was well worth the effort. The Tobii device is sitting just below the monitor and captures eye movements after a simple calibration. This Tobii is set to respond to a gaze of 100 milliseconds and it has an enlarged cursor set to move slowly. Tobii can be adjusted in almost any way you can imagine. It replaces a mouse and allows my student to use some of the best software around, including First Author by Don Johnston Inc. and Choose It Maker 3 by HelpKidzLearn. 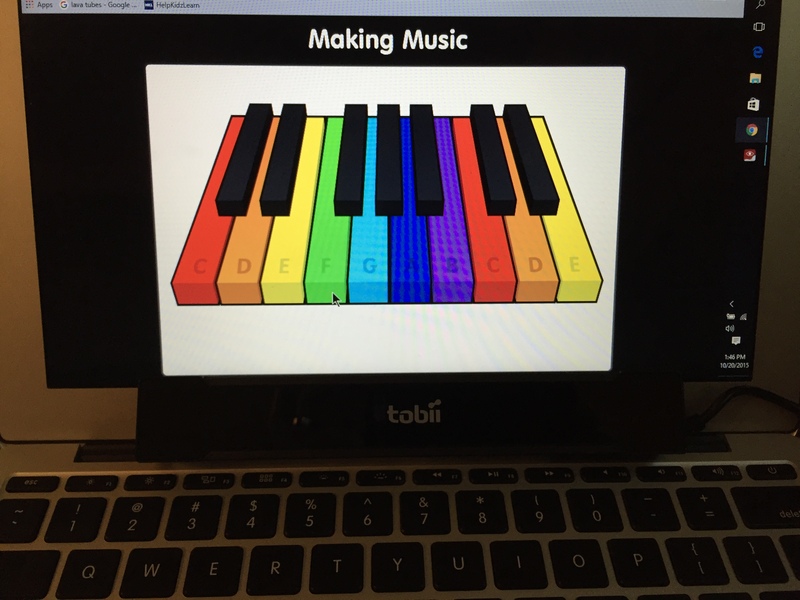 I am SO excited about Tobii and its potential to change my student’s life! It is totally awesome! Maybe a bit less. Maybe even more. 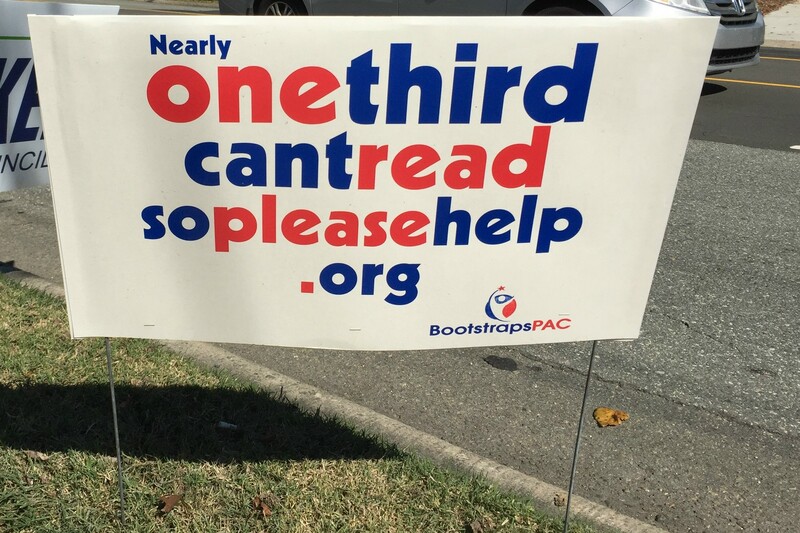 As we approach the November elections, these “One Third Can’t Read” signs are popping up across the Triangle area (Raleigh, Durham, and Chapel Hill in North Carolina). Who is putting up these signs? Is it true? The Bootstraps PAC is a local group concerned about the miserable reading performance of economically disadvantaged children. Here are two snippets from their stats section. This first clip compares those who failed to read at third grade in three districts and what percentage are poor kids. 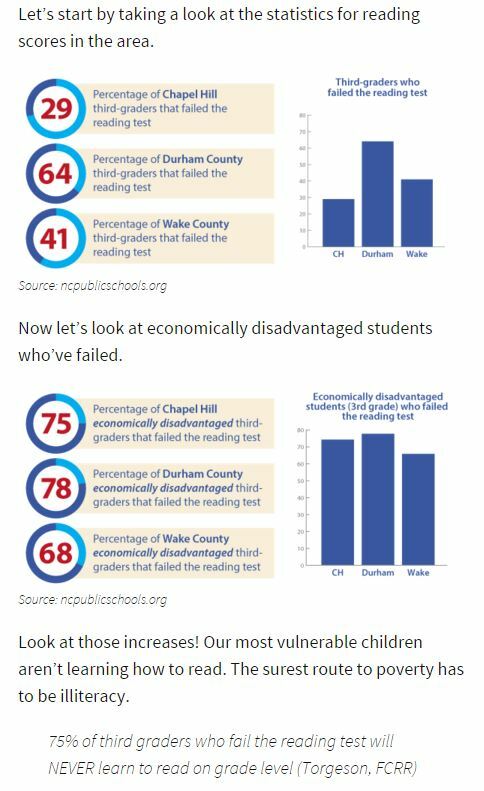 In case you can’t tell, 68% to 71% of kids failing the test are economically disadvantaged. The following snippet shows the percent of kids who failed the 3rd through 8th grade reading tests and the percent of those who are poor. Same pattern as above. 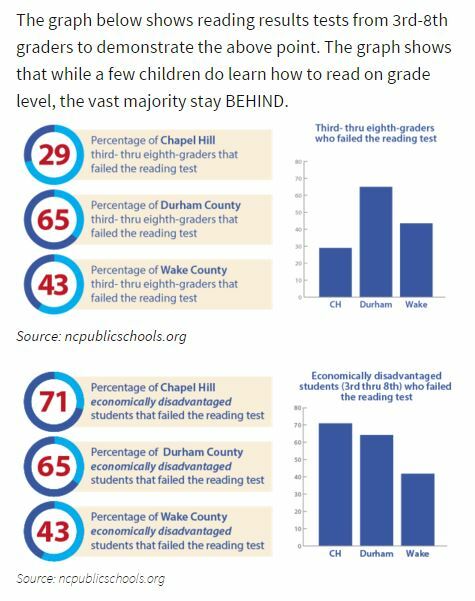 Check out the resource-rich Chapel Hill-Carrboro school system’s achievement gap. We are talking about racially predictable test scores, folks. Literacy is a vital door to future economic success, but our poorest students are left behind. Do we really believe all kids can learn to read? Do we provide the kind of reading instruction that does not penalize kids with relatively weaker language skills? Are we willing to mentor kids? Are we willing to volunteer? I appreciate the historical background of Black History month, first celebrated as a week in February, 1926, to coincide with the birthdays of Abraham Lincoln and Frederick Douglass. Since 1976, every president of the US has designated February as a month to honor the achievements of black Americans. So why don’t we have a White History month? Because white history is the norm, already an integral part of the school year. Isn’t it time to routinely recognize our country’s black heritage every month as well? One tool for designed especially for folks living in North Carolina (but useful for any state) is The Heritage Calendar. These are available online as a free download, along with lesson plans for multiple subjects and grade levels. These calendars are available as far back as 2013 and include super photos and bios of a broad range of individuals. 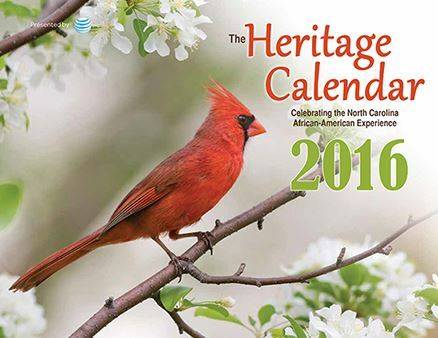 As Vanessa Harrison, president of AT&T NC writes, these calendars feature people of all races who “have contributed significantly to the lives and experiences of African Americans in our state.” Published by AT&T in coordination with the Department of Public Instruction and UNC School of Media and Mass Communication, along with The News and Observer and other organizations, each month features individuals such as Joan Higginbotham (3rd African-American woman to fly in space). Day-by-day recognition of many “firsts” is another helpful feature of the calendars, including birthdates and significant facts on Americans from Harriet Tubman to Quincy Jones to Colin Powell. Let’s become familiar with our ENTIRE heritage, not just portions of it. It’s easy to forget that we don’t all process the sounds of the world in the same way. 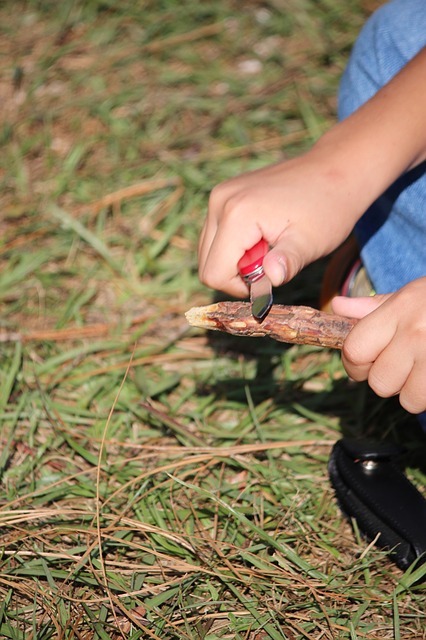 Here’s a thoughtful post on strategies for coping with NOISE. I carry a set of earplugs with me. I keep a pair in my car and in all my emergency kits. I hate earplugs, but… they help me blend in while getting me through the most difficult circumstances. I have used earplugs in class when a video was too loud or if just the class in general was too loud. I have used them to fall asleep when the world just seemed louder than normal. I use them less now than I used to, but they are my coping skill when I can’t handle things. I feel like my life is a series of trying to blend in by finding ways to do normal things abnormally. Not that anything I do is really abnormal, it’s just thinking outside of the box. * Laughter the best medicine – Car parts, driving and sartorially challenged mechanics! This post is absolutely hilarious. Chris the Reading Ape reblogged this post- and I am, too! It’s terrific! In a previous post, I reviewed “It Jes’ Happened: When Bill Traylor Started to Draw” by Don Tate. This book is so visually engaging that I wanted to create a way for a special needs student to experiment with drawings inspired by Traylor. I can share examples of Bill Traylor’s work with my student from online exhibits. 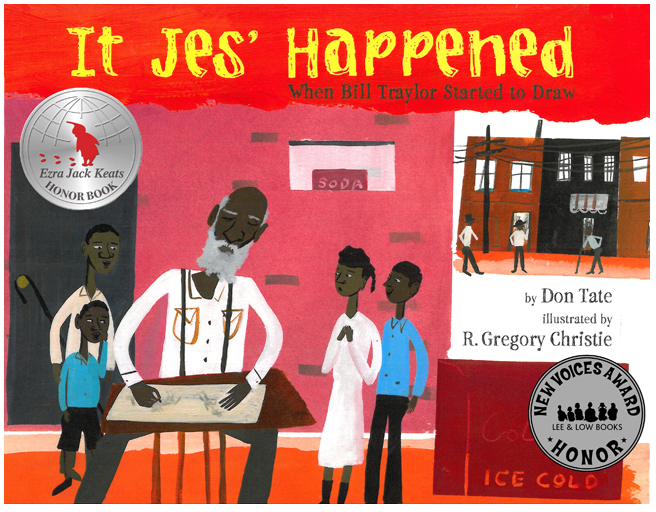 The artwork by R. Gregory Christie in “This Jes’ Happened” is also inspirational. My student does not have the ability to hold a crayon or paintbrush independently but can select items using eye gaze. 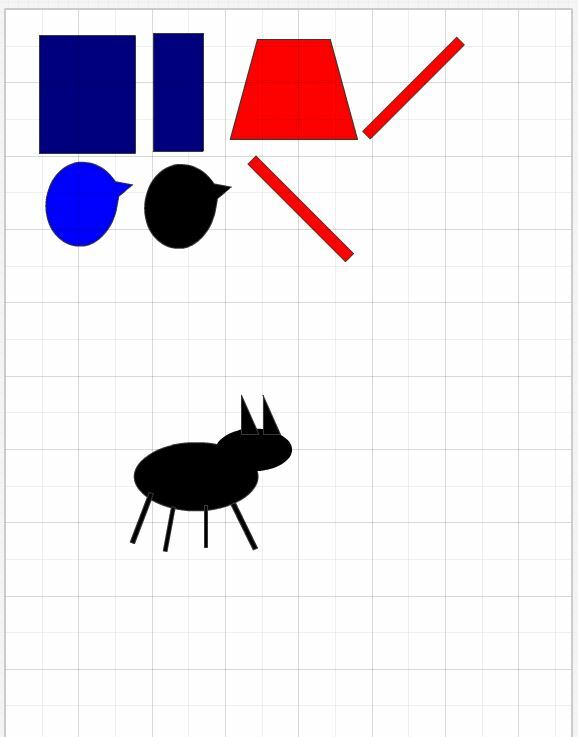 I used Avery’s 8 1/2 x 11 printable magnetic sheets to create parts of figures and familiar items, copied from Traylor’s use of basic rectangular and square shapes. I also borrowed his rich use of primary colors. Using Avery’s Design Pro (a free download), here’s a sample of the images I’ll print. By adding more shapes plus arms, legs, torsos, and heads, my student can create his family and home. The program is simple to use and I can save my designs online or on my computer. 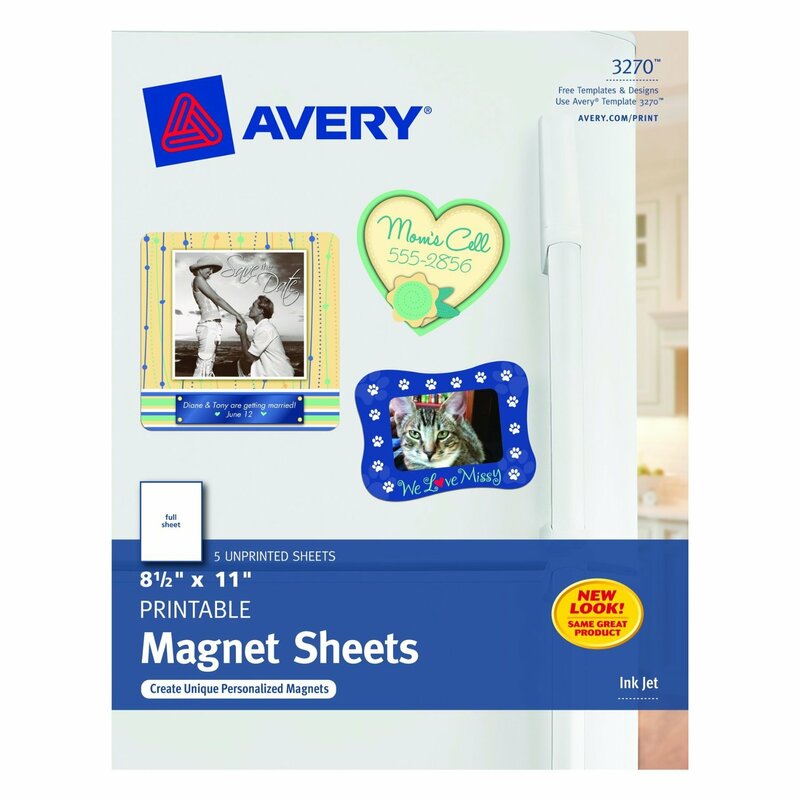 I’m excited about using Avery’s magnetic sheets for more projects! When Bill Traylor Started to Draw. Author and illustrator Don Tate has given us a rare glimpse into the life of Bill Traylor, a former slave who has become “one of the most important self-taught American folk artists of the twentieth century.” Traylor lived long before movies were created, but Don Tate has managed to capture Bill’s life, voice, humor, and grief. It’s a life worth seeing. Tate uses rhythm and repetition to draw our attention to Traylor’s inner life, while recording events almost poetically-all in a southern accent. At first I was disappointed that Tate had not illustrated his own book, but R. Gregory Christie paints images with the style and humor of the original artist. This book could be used effectively from elementary through high school (and beyond). It would be at home in courses from literature to art to history. Tate is a gifted writer whose style alone is worth analyzing. But Traylor’s life is the heart of the book. What was it like to live as a slave, then a poor sharecropper, and finally homeless in an unfamiliar city? What emotions drove the 85-year-old Traylor to draw about 1500 images on cardboard and discarded bags? It’s as though Traylor’s memories pushed their way through his long life, birthed on the sidewalks of Montgomery, Alabama. Spend some time with this book. It’s rich in color, meaning, and insight. I thought I was ordering a children’s book, but I have been delightfully tricked. Get a copy for yourself and see!